The key to a great social media strategy is sharing great content, whether you discover it online or create it yourself. Either way, content curation can be a time-consuming process. Luckily, HootSuite’s ability to integrate RSS and Atom feeds from any blog into your dashboard means that sharing great content to your social networks happens automatically, saving you both time and effort. 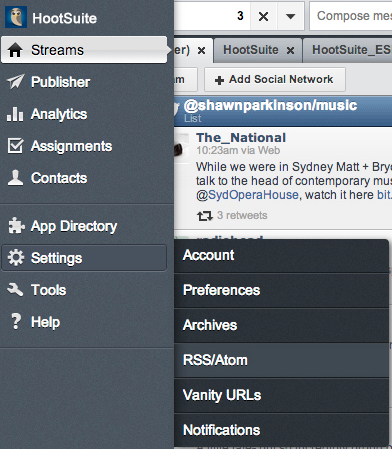 In launch menu on the left of your dashboard, select the Settings (gear) icon and choose RSS/Atom. Under RSS/Atom in the pop-up, select the + icon. 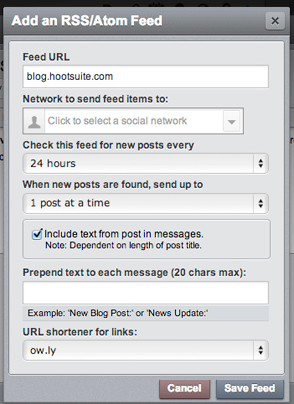 Then, select a profile from which you would like the RSS/Atom feed to post and how often HootSuite will check for new posts. Now, choose how many posts will occur at one time. If you want to set a standard message to go out with your RSS/Atom feed, fill in the optional “Prepend text to each message” field. Not sure what to add? Try an intro to your blog or a hashtag. Note: If you ever wish to delete your RSS/Atom feeds, first select the Settings icon and choose RSS/Atom. Click the Delete (garbage can) icon next to the Rss/Atom feed you would like to delete. Click OK.
Keep an eye out for a new #HootTip each week – they’re short and sweet so that you, your friends and your followers will be HootSuite experts in no time.